The Seasiders once again started this game with a much changed and re-shuffled teamfrom their previous game. Anthony Coffey started at fullback; Matty Young and Tom Ratcliffe played in the centres with Joe Lenton and Graeme Jeffrey on the wings. Up front Wesley Langkilde started in the front row with Andy Rossol, Drew Govier and James leach comprising the loose forwards. Scarborough looked the more dynamic of the sides in the opening exchanges and it was no surprise when they took a 5-0 lead with a Tom Harrison penalty in the 11th minute. And they re-doubled their efforts from the re-start with scrum-half Jordan Wakeham and fly-half Tom Harrison on the front foot. However a loose pas by Harrison was intercepted by back row Simanu Tusinga who raced over half the length of the field to score in the 16th minute. Fly-half Philip Town converted for 7-3. Stunned by that score the Seasiders lost composure and visiting centre James Marshall swept aside a series of flimsy tackle attempts to romp over. Town converted for 14-3 in the 24th minute to stun the Scarborough faithful into silence. Scarborough dominated the last ten minutes of the half with a series of attacking lineout’s but had neither the skills or composure to cash in and a couple of Harrison penalties was their only reward and they trailed 9-14 at the break. Old Brods made a lively start to the second half with Tusinga making several powerful breaks but good work by the youthful home backrow particularly Leech and Martin thwarted the Samoan’s best efforts. And it was a slick move that sent Ratcliffe in at the corner wide left to level the scores at 14-14 in the 49th minute. Back in the game, coach Lee Douglas’ men seemed to nod off and Tusinga ripped them apart with tries in the 52nd and 58th minutes aided and abetted by some woeful tackling. Flyhalf Town converted the second for a 26-14 Brods lead. Waking from their slumber Scarborough reapplied themselves to their task and good work by Coffey and Langkilde pressured the visitors into an infringement and Harrison slammed over another kick to reduce the arrears at 17-24 on the hour. With Joe Lenton off injured, Toby Welsby replaced him and was immediately in the action in a flowing threequaters move as broken play became the order of the day. However, the next try came from first phase possession when Wakeham and Harrison combined to switch the play and the latter’s kick found Ratcliffe whose finishing skills produced his second try in the corner. Harrison reduced the arrears at 24-26 with minutes to go. 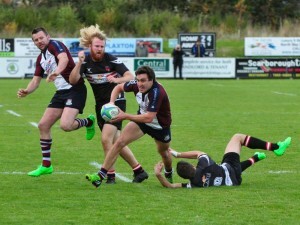 Scarborough butchered the re-start and following a charged down clearance Brods’ flanker Alex Dawson touched down for what looked like the last gasp winner in the 79th minute. However Scarborough refused to lie down and following good work on the Brods’ 22 the ball was moved blind for Ratcliffe to shimmy through the tightest of gaps on the touchline and cut in to ground under the posts. Harrison added the extras to level the scores in injury time. All over? Not quite; referee Mike Ramsden added a lengthy period of injury time during which Samoan Tusinga almost added his fourth try but the final whistle eventually ended a remarkable game after 86 minutes!! 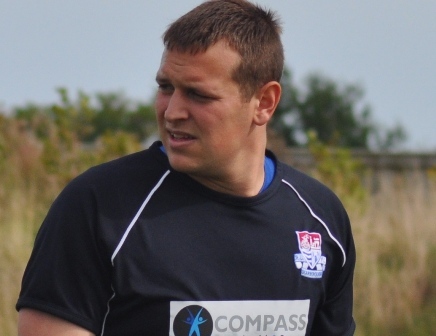 In a patchy performance, once again Scarborough’s youngsters let no one down. Govier, Martin, Leech and Wakeham shone whilst the pick of their more experienced teammates were Coffee, Harrison and Ratcliffe. TOM RATCLIFFEThere were other contenders but skipper Tom Ratcliffe’s finishing skills were the difference between defeat and a creditable draw for his side.